FAVORITE THINGS: When Men . . . The summer of 2016 was filled with the deepest sense of empathy I had ever experienced. Sadly, I had considered myself almost numb to the constant tragedies permeating my community and the communities of people dear to me, but in the cases of Alton Sterling and Philando Castile as well as the Pulse massacre, my spirit was heavy with grief and frustration. The dance studio afforded me the space to share and cope, to create work that—one hopes—will allow others to do the same. I needed to respond to these tragedies devastating my community. What does equality look like? What is the meaning of freedom? How do we resist? In a world that tries to make us something other, not men. 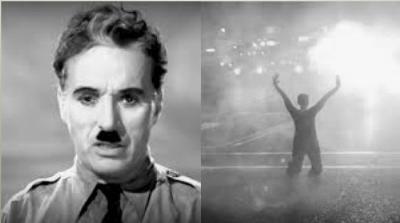 . .
Charlie Chaplin’s words from The Great Dictator held such weight for me; they became the foundation for the piece. Chaplin’s film from 1940, condemning Hitler, fascism, dictatorship, has chilling resonances today—for all of us. What does resistance and authentic individualism look like when opposing hive mentality? When Men. . . begins with a trio of men moving to the multitude of rhythms in Chaplin’s cadence. 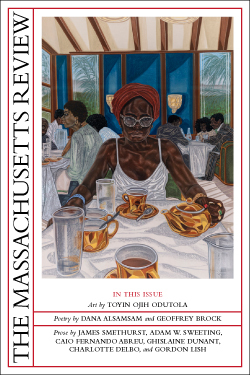 The piece is in constant fluctuation, inspired by a diversity of forms: the grace of ballet, the elongated lines and angles of Horton, the weighted curvatures of Graham technique, the rhythmic groundedness of Hip Hop and West African dance. Societal directives—such as “Fall in line!” and “Don’t be so emotional!”—shape the more rigid steps (like toys, machines) but are negated by the dancers, through an embracing of the heart and strong reaches, as if trying to get beyond their current circumstances. The latter half of the piece begins with a drastic change in tone, guided by sultry guitar strums with a solo by each dancer and followed by a whirlwind of group partnering, where the men seamlessly fly from one to the other and melt into the floor in the same breath. Later in the piece, Chaplin’s speech is reprised. Now the men show more freedom and resilience in their movement. The dancers reach the climax with new purpose. They carry this with them through the rest of the piece as they take opportunities to embrace themselves and protect each other. With their last breaths, as the dancers appear to be completely overcome by despair, they reach out one last time. They take their hearts back for themselves and make a final stand of solidarity as individuals, as men. When faced with opposition toward our pursuits, we must protect them. We must refrain from letting anyone dictate our values or the value of what we have to offer. All too often in today’s social and political climates, where daily we are being killed, it feels revolutionary to merely exist as an honest, loving, hardworking, unapologetic black man. Almost as if I’m challenging the society I live in by simply breathing. Yet there’s a responsibility in being granted the gift to draw breath. We must fight. We must unite. We must find the way. In memory of Alton Sterling and Philando Castile. Joshua L. Ishmon is a dancer and choreographer at Deeply Rooted Dance Theater of Chicago.